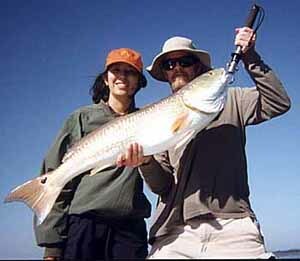 The two most sought after gamefish in the Titusville area of the Indian River Lagoon are the redfish and sea trout. Sometimes snook and tarpon are caught as well. This page is designed to increase your odds of finding these fish and catching them. However, nothing will help you find more fish and catch them as having the advantage of an experienced guide. These people are professionals at fishing this area and are on the water almost every day. They've spent years fishing this area, and keep meticulous notes on where the fish tend to be in any weather condition and at any time of year. They are excellent teachers and love to pass their knowledge on. If you're new to fishing the Titusville area, A guide will likely put you on more fish in one day than you will probably find in several weeks of fishing on your own. However, some people (myself included) enjoy the challenge and excitement of fishing new waters for themselves. If this is you, read on. FISH SPECIES: "THE BIG FOUR"
Legal limit is one per day, and must be between 18 and 27 inches in length to keep. The SPOTTED SEATROUT is another extremely popular fish here. Often found on the flats with redfish and will hit much of the same baits and lures. In the winter they congregate in deeper canals. Not partial to dead bait. Can reach up to about 20 lbs. Legal limit is 4 per day with a minimum size of 15 inches and only one may exceed 24 inches. All Seatrout must be released during November and December. Snook like to feed near the mouths of creeks and around mangroves and occasionally out on the open flats. They can be caught on fly or spin tackle, take live shrimp and mullet. they sometimes are found going up into freshwater tributarys. when fishing for snook, use a heavy monofilament (30 - 50lb) shock leader as their cheek plates can be razor sharp. The legal limit is 2 per day with a minimum size of 26 inches total length and a maximum of 34 inches. Closed seasons are December 15 through January 31, and the months of June July and August. During these periods all snook must be released. Hooking into a tarpon is an experience you will never forget. When hooked, these oversized members of the herring family often explode into an aerial display that few fish can match. They can be caught on fly or spin tackle on streamer flies, plugs, spoons, jigs, and live bait such as shrimp and mullet. They can often be seen rolling on the surface, and inhabit the flats as well as side creeks and tributaries. A heavier monofilament shock leader is advisable as they're mouths are extremely abrasive to monofilament. Essentially a catch and release fishery as Tarpon are not noted for their food value, a Tarpon Tag must be purchased for each tarpon you intend to keep. The principal habitat used by reds and trout for feeding in this area are the expansive shallow seagrass flats that cover the shallows of the Indian River Lagoon. These grass beds form the basis of the ecological food chain in the Lagoon. The algae that forms on these grasses provide food for young fish, shrimp, crabs, and other invertebrates that gamefish feed on. In addition, the grasses also provide cover for these creatures to hide in as they try to avoid being eaten, therefore it is on these grassflats that the drama of life in the lagoon takes place and also the best fishing. The principle forage species for reds and trout are shrimp and mullet, a vegetarian fish that feeds on the algae mentioned before as well as the grasses themselves. These are also the two most widely used baits used for reds and trout. Live shrimp are readily available in most local bait and tackle shops while the "finger mullet", (young mullet 3-6' long) are sometimes available but usually caught by the angler using a cast net. If you're new to the area, live shrimp are the best bet. This portion of the lagoon system is pretty much isolated from oceanic tidal influences due to the fact that the nearest inlet is over 40 miles away. Therefore the fishing here is not influenced by tides as it is in other estuaries. It is more governed by temperature. During the heat of the summer the fishing slows down a bit and the best chances for success are early mornings and late afternoons, with the early mornings better in my opinion. The summertime here is also the rainy season where afternoon thundershowers occurr almost daily in normal years. I've had very good success going out in the early evenings after the storms have come through and cooled things down a bit. In the spring and fall, I still like to be fishing at first light because it's when the fish are more active, however the fishing does last later into the day and action can be found all day. In the winter when we have an occasional cold spell I like to find deeper holes and canals as the fish tend to congregate in these deeper areas seeking warmth. The fishing can be great at this time for seatrout. Again, early and late are the better times. Basic tackle that I use for reds and trout includes a spinning rod and reel holding about 150-200 yards of 10 lb. test monofilament line. Redfish and trout will strike a variety of surface and subsurface lures, and there are thousands of lures manufactured that target these species and, more specifically, the wallets of fishermen trying to catch these species. It can be real confusing trying to stock a basic tackle box. However, there are a few that have produced for me over the years ever since I was a kid growing up in Satellite Beach and have continued to produce for me since I moved to Titusville in the early 1980s that I consider essential. Johnson's weedless Silver Minnow in the gold finish is considered to be the redfish standard. Having a weedguard, it can be used in very shallow water without pulling up a huge clump of weeds on every cast. When fishing over slightly deeper grass flats, 3-4 feet deep, I have used Johnson's sprite silver spoon with great results on school sized trout (1-3 lbs.). The size I like is about 2 1/2 to 3 inches in length. As a kid growing up in Satellite Beach I used this lure to find schools of trout by trolling this lure behind my boat at slow speed along the 3-4 foot depth until I got the first fish and then would stop and catch more fish out of the school. Another lure type that's catching on in this area are the Bass Assassin weed-less plastic baits that are rigged much like the weed-less worms more commonly associated with freshwater bass fishing. The hooks used for these are specially designed for these baits. They have a slightly weighted barb attached to the eye of the hook that is inserted into the front of the bait and then the hook itself is inserted farther back with the point left inside the bait, making it weedless. (My neighbor's kid's showed me these and with as many fish as they catch, I definitely trust their opinion). Though they hare not readily available here in local tackle shops, I have used flat-headed jigs designed for bonefish on the flats with good results. You can get these at any of the major mail order tackle outlets. Look for ones with a brownish shrimp-like pattern. I like these better than the bullet head variety for one reason. The sink rate is a little slower and these are much better for using on the shallow flats around here. When I use live shrimp for bait, I use a #2 bronze hook with a regular shank. While I occasionally use a float I often just free-line the shrimp on a hook only. Hook the shrimp just beneath the "horn" on its head in the clear area just past where it meets the head. When using live-finger mullet I free line them on a # 1 bronze hook. Hook the mullet just behind the dorsal fin taking care not to put the hook through the mullet's lateral line or spine. Another easy way to target nice redfish is to make a leader by tying a barrel swivel to one end of a short piece of 20 lb. test monofilament line of about 24 inches in length, and a #1 hook to the other end. You then slide a � ounce to one ounce egg sinker onto your fishing line and attach the leader to the line below the sinker. (check out the Knots and Rigs Page.) Then use a chunk of cut mullet as bait and cast to a sandy looking spot on the flats. The added weight will allow you to cast to slightly deeper water without getting your feet wet, while the smell of the mullet will draw reds to the bait. I've never done this as I usually use artificials but I've seen some large redfish caught from shore along the Max Brewer Causeway. It works with live finger mullet as well. The sliding sinker allows the line to feed through sinker giving the mullet some swimming room. In my experience, trout do not respond to dead or cut baits as reds do. One area where I feel a lot of fishermen go wrong is the excess use of terminal tackle when rigging their lines. Avoid "prepackaged" rigging like the plague. You see these rigs almost everywhere you can buy tackle. They usually consist of a nylon-coated leader with nice shiny crimps, a sinker of some sort, and big snaps for attaching the hook. They are designed for sales, not catching fish in my opinion. I try to fish with as little terminal tackle as possible for reds and trout. When I free-line a live bait I use just the hook tied straight to the line, and I have never had a red or trout cut through the line. If I do feel a need to add a little weight I make my own leader about 18 inches long by tying the hook to one end of a length of monofilament line and a small barrel swivel to the other end using Improved Clinch Knots. Then I slide an egg sinker onto the line from the reel and tie the leader to the line below the sinker using the same knot. Puppy Zara Spook, recently introduced, one of my new favorites for reds, and trout. I've had hits from small tarpon as well. Johnson's Weedless Silver Minnow in gold finish, the redfish standard that no tackle box should be without. Bass Assassin Shad Lure, rigged weedless like a plastic worm, works well on trout, reds, snook, and tarpon. Rig with Eagle Claw weedless hooks, size 4/0. Eagle Claw regular shank hooks, #2 for use with live shrimp. Floats (bobbers), I've used plastic with success but I prefer 1" diameter natural cork. Eagle Claw regular shank hooks, #1 for use with live mullet. Black barrel swivels (without snap) size 5 or 6 for making monofilament leaders. Small Spool of 30 lb. test monofilament, for making leaders, particularly if snook or tarpon enter the scene. Egg sinkers, 1/2 - 1 oz. Go to the knots and Rigs page. Fly fishing for the four species mentioned above is becoming increasingly popular in the Titusville area and has been portrayed on T.V. shows like "Walkers Cay Chronicals" among others. Basic flyfishing tackle for the lagoon would be a 9' #7 to #9 weight rod and a reel capeable of holding a weight forward saltwater taper floating line and about 150 - 200 yards of 20 lb. test backing. It's very important that the reel have a good drag. Flies that would be used would be minnow imitations such as the Lefty's deciever, or any number of the shrimp patterns tied such that the hook rides barb up when the fly is in the water. I like the natural colored patterns but lots of people do well with the more brightly colored patterns. I like to cast around culverts that connect the impoundments on Merritt Island Wildlife Refuge especially when the culverts are flowing. (see locations, next page). The most popular flyfishing here is stalking the grass flats for tailing reds. Saltwater poppers are another great option and there is nothing like a surface strike to get the heart pumping. This first page of fishing the Indian River Lagoon has concentrated on descriptions of the primary game fish caught here as well as the type of habitat they are found in and the tackle used to catch them. Page two discusses locations, whether your fishing from shore, paddling a kayak or canoe, or launching a boat. It also contains a brief description of other species that can be caught in these waters.